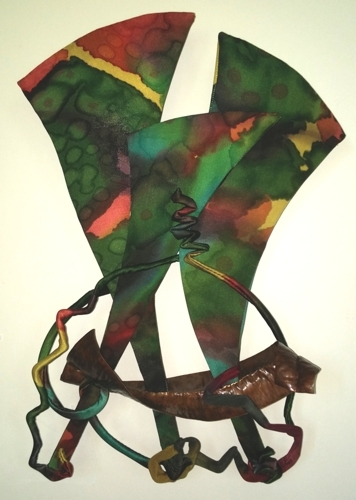 Color and movement abound in this large wall sculpture made of hand-painted silk and hand-formed, forged metal with multiple clear coats of varnish. Clay beads join the pieces. Silk is covering wood, with an additional wood backing for sturdiness. A tribute to all the sea travelers for millennium. Made of hand-painted silk covering aluminum so I could bend and curve it to resemble sail shapes. The nu-gold metal is hand formed and forged. The 3" deep base is Lychee wood. Movement of the ocean, with surprises interspersed like the coral and the fish. 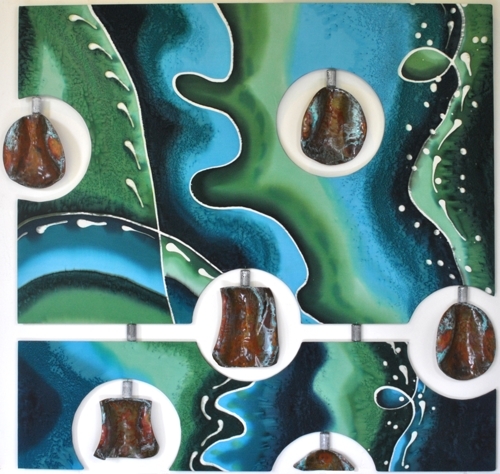 Inspired by the ocean around Hawaii, this large wall sculpture is made of hand-painted silk and hand-formed, forged metal with a patina finish and multiple clear coats of varnish. Clay beads join the pieces. Silk is covering wood, with an additional wood backing for sturdiness. 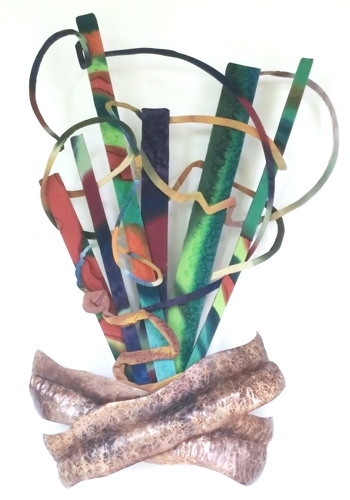 Sea Jelly induced by combining metal forming objects and colorful silk panels and wrapped wire. Metal forming vessel sprouts colorful hand-painted silk blooms. Inspirations of a ship and its sails, and the many colorful journeys they take together. 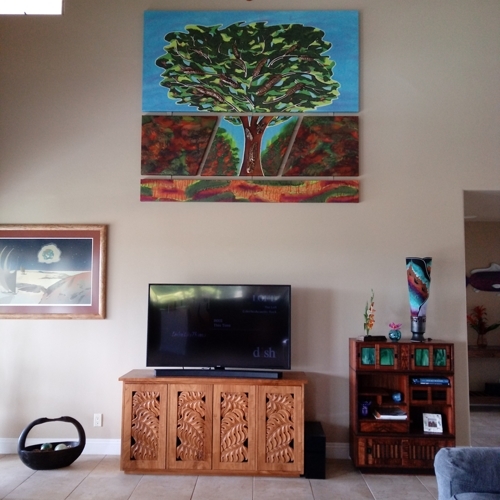 Waimea residents Deb and Rick wanted something large, and sound absorbing for their 2 story great room. This 5 sectional piece was originally hand-painted silk, then scanned to be on canvas and framed up with quilt batting behind to absorb the sound. The 5 sections were secured together before mounting this 8' wide by 7' high artwork.